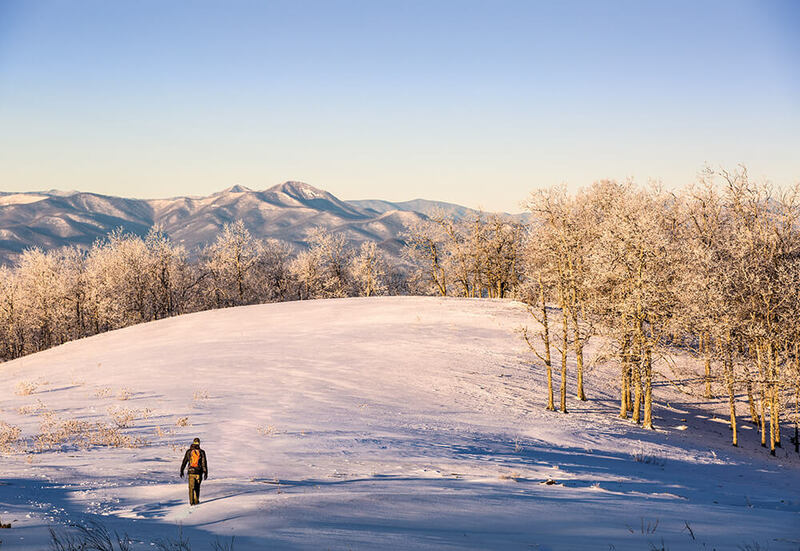 In North Carolina, a forecast of snow sparkles with promise and possibilities: of a day to sled, to sleep in, and to see the landscapes of our state at their softest, quietest, and loveliest. 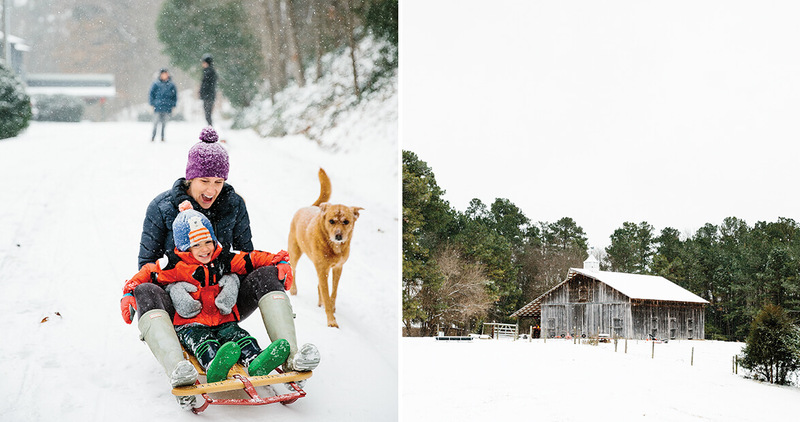 Featured images, above: Snowy scenes in Chapel Hill: Samantha and Perry Terhune sled down their driveway with Bolo the dog, and flakes fall on a barn on Mount Carmel Road. They’ve told you and told you, but you don’t believe it, won’t believe it, daren’t believe it, not yet, because everyone knows that the more certain you are of something happening, the more certainly it won’t. You’re allowed, though, to open the toolshed, sneak a conspiratorial glance at the sled or the saucer hung high on the wall, above the wheelbarrow and the bags of birdseed. Go ahead and finish your math homework or meeting presentation because if you don’t, there you’ll be in the classroom or conference room tomorrow with your bare face hanging out. The baking sheets and the boots will still be where you know they are, in cabinets and closets; leave them alone for now. Do what you ordinarily should and would, so as not to jinx the rest of us tiptoeing across that tightrope of hope, ignoring the gut-flutter so familiar from Christmas Eves and birthdays and the night before a vacation. But it’s a-comin’. When else do the clouds hang so leaden and low? You’re allowed a modicum of prep — a grocery run, and a quick check of the drawer with the hats and gloves to make sure both the right and left hands are there and that moths haven’t gotten into the scarves. And now, there’s just that electric stillness that comes with waiting for weather — specifically, snow. It might snow in March, and probably will, bending the heads of the poor daffodils. But nothing — nothing — ranks with, compares to, or equals the first snow of the year. Why? The wait. You’ve waited through the false forecasts and the not-white Christmas; waited through the bleakness of bare branches and backyards; waited through the bone-cold wind chills on a string of freezing days, when the sun just shines and shines, squandering temperatures that are ideal for snow. You’ve endured a spate of raw and rainy days, thinking: What if that were snow? Think how deep it would be! Regretting: Such a waste of precipitation. You’ve wistfully watched New Englanders shoveling snow on the evening news, counted the days since it thundered. But now? It’s our turn. Were we better off before sophisticated forecasting equipment was around? Back when we had to be content with — or wring our hands over — vague predictions rather than assured promises? When that deep foot or that mere dusting was almost always a surprise, offered as a “chance” rather than a probability? Maybe. Given the choice, would you rather a snow happen overnight, under the cover of darkness, while you dream and slumber, so that you’re greeted — woken, even — by that unnaturally bright white coverlet that’s outside the window? Or in the daytime, so that you’re able to watch every flake descend, to be fully aware of every magical moment, to witness the incremental accumulation of white? For me, night. No, wait, day! And then there’s the question of falling preferences: Frenzied, a vertical sheet, like strings of beads in ’60s doorways? Rapid and furious, a veritable snowstorm. Or lazy flaking, spaced enough to catch on your tongue and eyelashes? Soft, gentle, whispery white kisses. Both, please. A collective thrum of excitement zings through offices and stores and restaurants, tingling the feet and stirring the heart as sure as any hopeful Broadway show tune. 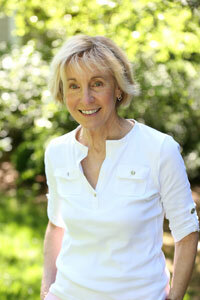 If you’re alone, hold that physical shiver of gladness close, to recall on some torpid summer day to come. Pity the poor teacher charged with instruction and order when the beautiful chaos begins, then envy him or her, experiencing sheer thrill firsthand. Because as we age, wherever you are on the snow spectrum — whether you love or loathe the stuff — a child’s glee at the season’s first snowfall is as pure a joy as any of us are ever likely to experience. For a grandchild or your inner child, get out there, tilt your head back, and catch a flake. Or two. Or 20. Falling, falling. Covering, deepening, becoming that proverbial blanket of white — a cliché we’ll overlook because The First One deserves it. Whether next week or next month, the next snowfall — be it a snowmaggedon or a dusting — will never hold the same pure-white delight of a first snow. 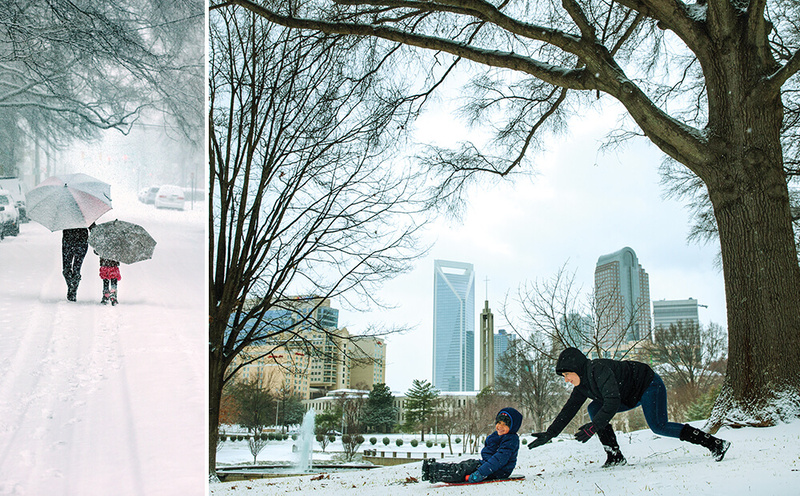 When big, frosty flakes turn Charlotte into a giant snow globe, residents find winter wonderlands all over the city. Some make tracks in fresh powder in the Dilworth neighborhood (above). Others tote their sleds to any snowy expanse they can find. Uptown’s Marshall Park (right) may not be especially hilly, but it offers views of the skyline. 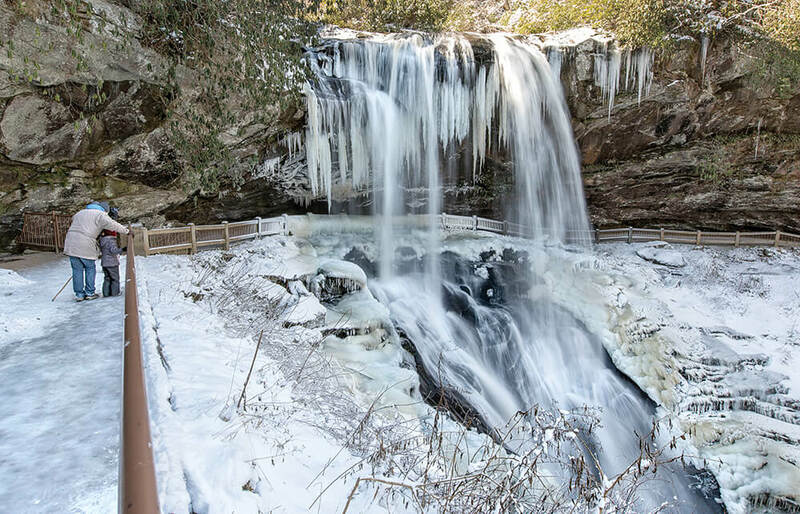 Whereas much of the state falls silent under a blanket of snow, the waterfalls of western North Carolina roar as loudly as ever. But on the coldest days of winter, something magical happens at Dry Falls outside Highlands: Some of the water’s spray freezes, forming spectacular ice formations like stalactites in a cave. Here, frigid temperatures and rushing water work together to preserve a moment in time — and, for a young hiker out for an adventure with Dad, a shared memory. In the Sandhills, where winter temperatures are milder than much of the rest of the state, a snow day is a relatively rare treat that covers the sandy soil with a gentle dusting of white. 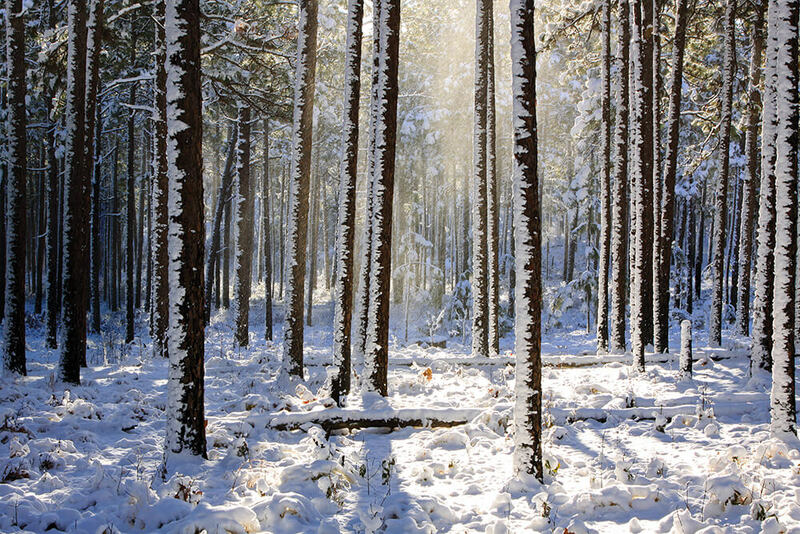 At Weymouth Woods Sandhills Nature Preserve in Moore County, one of the last strongholds of the towering longleaf pines that used to cover vast stretches of our state, snow clings to the trees, lacing evergreen needles and coating dark trunks. In the stillness of early morning, before eager visitors arrive to walk among the trees and play in the snow, you might spot some of Weymouth Woods’ year-round residents, including foxes, deer, and the popular — but elusive — red-cockaded woodpecker. 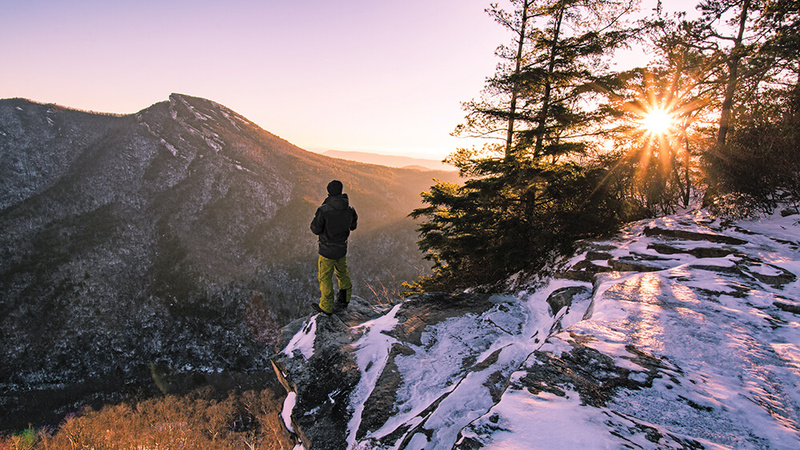 At sunrise, Wiseman’s View offers sweeping views of Pisgah National Forest, all bathed in golden morning light — including Linville River, 1,500 feet below, and Hawksbill Mountain straight ahead. 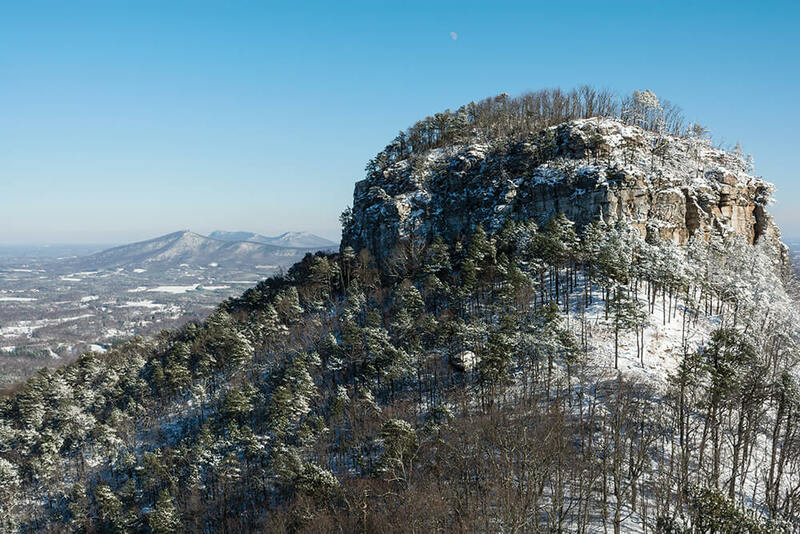 Wiseman’s View is known for being one of the best places to see the phenomenon known as Brown Mountain Lights. But at this time of day, at this time of year, there are no mysterious lights to be seen — just snow, all around.